Stream the hearing LIVE Here. The bill establishes a board which would be composed solely of people appointed directly or indirectly by the Governor that would oversee wolf control in Idaho. Originally the board was to be funded using $2 million in general funds but this amount seems likely to be only $400,000 due to shortfalls in funding for another program but it will likely be given $400,000 over the following 4 years to total the entire $2 million. An additional $220,ooo in funding for the board will be comprised of $110,000 from the livestock industry, and $110,000 from the Idaho Department of Fish and Game on an annual basis making a total of $640,000 available annually to kill wolves. The good lady from 19 (sic) mentioned that the population has decreased slightly and that the decreased pairs have decreased slightly. That may be true but the problem is that counting wolves is not an exact science. These are known, absolutely known numbers, not speculative, not the ones that have been seen but not confirmed. I assembled some numbers to address other specific points below. The population has declined by 30% since Idaho took over management of the species in 2009. The end of the year estimates are the measure referred to in the annual reports and at the end of 2009 there were an estimated 856 wolves. Presently the end of year population, based on the preliminary estimate given to the legislature by Idaho Department of Fish and Game biologist Jeff Gould, is “less than 600” and about 110 wolves have been killed since then. The Mortality records obtained through public records requests and published on the Idaho Department of Fish and Game website indicate that the population is likely to fall to around 460 animals by the end of March 2014 just before female wolves begin denning activities. 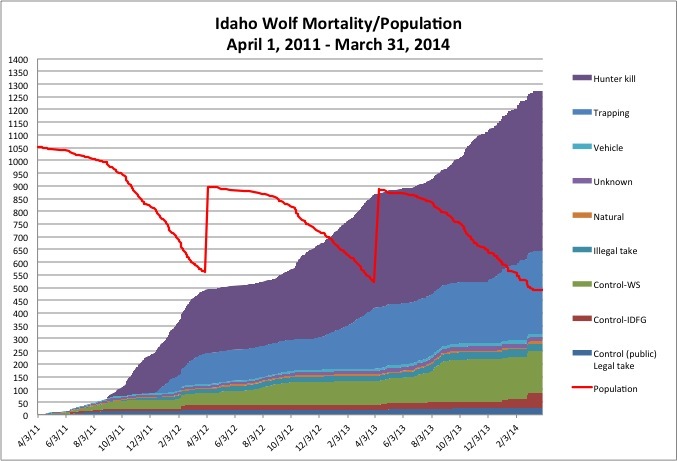 During the period from April 1, 2011 to the present 1,272 wolf mortalities have been documented by the Idaho Department of Fish and Game. 98.2% (n=1,249) of those mortalities were human caused, 1.3%, (n=17) were unknown, and 0.5% (n=6) were natural. Ken I listened (thanks for the link) and it is pretty horrifying how stacked it all is. I commend you for trying to speak, your clarity and gentleness, all of which was missed by all of them. I did not get the name of the one other person who was much more blatant and honest, and who was met with such incredible rudeness I could not believe this was a serious meeting – which I guess it was not. They simply dismissed anything either of you had to say. I am actually relieved there was no video for me to see the faces of these intransigent people. Thank you both. Thank you. Jon Robinson of ICL also gave reasonable and coherent testimony against the bill. What amazed me was the committee chair limited testimony to two minutes and instructed witnesses to “not get into the weeds” on the subject. I guess that means don’t present us with anything factual or anything we don’t want to hear. There were no questions of any witnesses, pro or con, from the committee. It was a done deal from the beginning.